On September 19th, 2013, the Greek Section had its 1st Technical Meeting for the 2013-2014 season. In the presence of a good audience of 32 members and 14 non-members, Dr. Ioannis Prousalidis, Associate Professor at the School of Naval Architecture and Marine Engineering of the National Technical University of Athens (NTUA), Greece, presented the above topic. 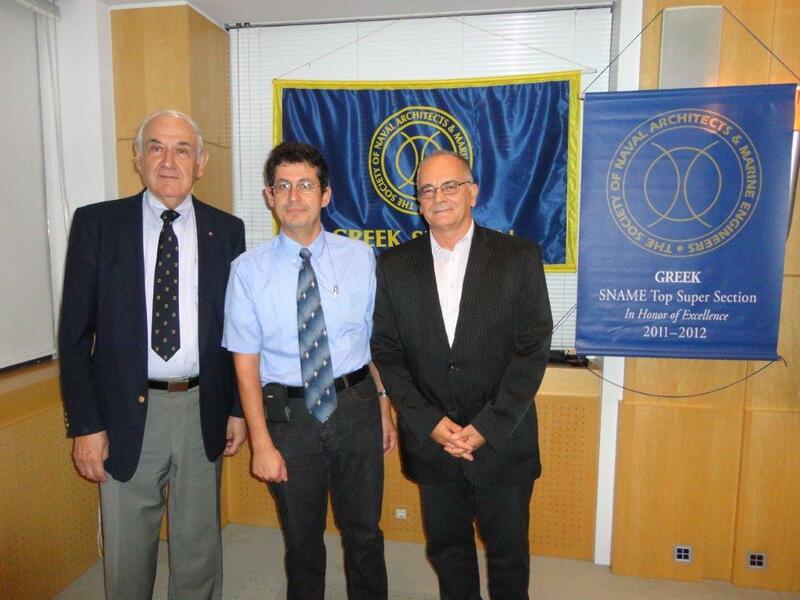 The presentation of Prof. Prousalidis addressed several issues related to the electrification of ship systems. Nowadays that the requirement for a more efficient ship (in terms of fuel consumption and emissions reduction) get very demanding, the electric platform is recognized as one of the most promising ways to attain these goals. The speaker explained the reasons why the electrification of most - if not all - systems onboard serves multifold “green ship” targets, bringing into light: the role of exploitation of low carbon fuels; deployment of renewable energy sources; exploitation of Waste Heat Recovery techniques; centralized monitoring and control systems; optimized ship operation in ports and Emission Control Areas (ECAs); and ship to shore (‘cold-ironing’) smart connections. The speaker also presented new challenges that have emerged in ship electric grids, including: covering large electric power demands; facing electric power quality problems; integrating high voltage technology; performing electric energy audits; and introducing electric power distribution via Direct Current. It was noted that several of the application areas addressed in the seminar are among the topics of the 2nd International MARINELIVE Conference on “All Electric Ship”, to be held in Athens, in November 20-21, 2013 (http://www.marinelive.org/2ndmarineliveconference/); the Conference is organized in the frame of the EU-funded project “Marine Electrical Initiative - MARINELIVE”, coordinated by Prof. Prousalidis. The seminar was followed by questions to the speaker and an interesting discussion on the topic of ship electrification. Main issues discussed were: (a) the cost of retrofitting existing ships, (b) the introduction of Direct Current (DC) in ship applications, and (c) the experience and present status on introducing ‘cold-ironing’ worldwide, with emphasis in Europe. The meeting was concluded with the traditional reception of the local section in an adjacent hall of the MARAN Tankers Management building. PS: Our next technical meeting will take place on October 17, 2013, when Prof. Michael Triantafyllou of Massachusetts Institute of Technology (MIT) will speak on the subject of “New Technologies and the Potential for Ship Overall Efficiency Optimization”.